The Windheuwel Poort is a short, natural poort which cuts through the hills and mountains adjacent to the Beervlei Dam, on the N9 route, 32 kilometers north of Willowmore and 80 km south of Aberdeen in the Great Karoo. The dam is instantly recognizable for it's unusual wall construction, consisting of multiple side by side, interlinked arched walls. The dam is also better known for being bone dry for many months of the year. Water is the most precious commodity in the Karoo. Wintersnek is located on a minor gravel road - the P3222 - about 21 km north of Barkly East, as the crow flies. It's a fairly straight-forward pass, with a long, almost straight climb to the 1991m high summit, after which there is a direction change into the east, followed by a short double apexed left hand curve to the end of the pass next to an unmistakable group of very tall cypress trees close to the roadside. The pass is 5 km long and has gradients of 1:11. 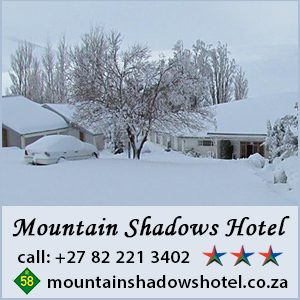 It offers spectacular views over the New England area and the Witteberg mountains. However, due to the gentle nature of this pass, it would be best to plot its position on your GPS otherwise you might miss it. It can be driven in any vehicle in fair weather, but will be slippery when wet. This short but very scenic pass is located to the south-east of Middelburg in the Eastern Cape, on the N10 national highway. There are no sharp bends and the road is perfectly engineered and constructed, allowing safe passage over the pass provided that you stick to the speed limit and are not distracted by the views. The area around the pass is typical of the Upper Karoo landscape, with low flat plains interspersed with rolling hills and koppies. The pass is suitable for all vehicles. The Wolf River Pass connects the mountain-top village of Hogsback with the Sandile Dam and Keiskammahoek to the south east. The pass is named after the Wolf River which is a tributary of the Keiskamma River, both of which feed into the Sandile Dam at the foot of the pass. The 27 km long pass offers a wide range of varying and often spectacular scenery descending a total of 667m producing an average gradient of 1:41 with some of the steeper parts presenting at 1:6. Allow plenty of time to drive this road and expect rich visual rewards. Watch out for logging operations, falling trees, livestock and wild animals. Although the entire pass is gravel, it can be driven in a normal sedan vehicle in dry weather conditions.